Thirteen months, just over a year. That's how long it has been since Guitar Hero Aerosmith was released. I picked the game up as an impulse buy when it was heavily discounted a few months ago. It lay in our game drawer until about a week ago, mostly unplayed. When we moved, the games got shuffled around, and when I reached in to see what caught my eye one night, tired from opening box after box, GH Aerosmith caught my eye. I summoned my 8 year old partner, and we grabbed our guitars and went for it. The first thing we noticed was that thirteen months may not be too long in real life, but that's not the case for music games. Guitar Hero Aerosmith runs on the GH3 engine. This was an awkward time for the franchise. Rock Band was the new hotness, and the obscene difficulty and ill-conceived boss battles of GH3 didn't hold up well in comparison. This awkwardness is even more apparent now; GH Aerosmith feels like a game from a different era. Only two player co-op, no drums or vocals, and a general lack of polish put a damper on the experience somewhat. The simple fact is, older music games just don't hold up well, reminding one of annual sports game franchises. So, are Aerosmith's songs fun to play? For the most part, yes. There are some real gems here. As a bass player, I had a great time grooving along in "Sweet Emotion". "Love in an Elevator" and "Rag Doll" are excellent, and you'll be singing along to Steven Tyler's big-mouthed vocals. It's a real shame that the game features only guitars. Tyler is easily the most identifiable member of the band, and it would seem like a no brainer to have made GH Aerosmith a full band game. Remember, Guitar Hero World Tour was already announced and on its way when this game was released. Why not save the license and do it up right? The game suffers a bit due to the guitar only limitation. Even with the limitations, GH Aerosmith is a good game. There's certainly nothing new here, but that's not necessarily a bad thing. Thankfully, the brutal difficulty of GH3 is gone. I played Bass on Hard and had no trouble. My son played on Easy and had no problems whatsoever. We got about halfway through the list in just a couple sittings, which is pretty quick, but there are just 30 songs in career mode, plus unlockables. Had I paid full price, it might have bothered me more, but for $10 it was a bargain. The best part of the game? Hearing my son singing his version "Rag Doll" in the shower a few days later. 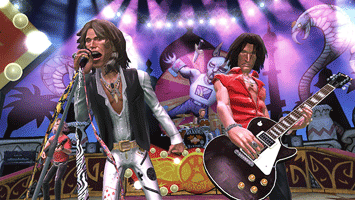 Music games make for good times and good memories, and Guitar Hero Aerosmith is no exception. Page created in 0.8888 seconds.